The Great Pumpkin Halloween Party: So much fun, it’s frightening! Join the other ghosts and ghouls that haunt The Leopard Lounge & Restaurant during our annual Halloween bash. Enjoy a special three-course menu and drink specials amid the glow of real jack-o’-lanterns, get your groove on to the live music, and enter our costume contest for a chance to win prizes — the more over-the-top, the better! Date: Saturday, Oct. 28.Time: 8:00pm – midnight. Price: $48 per person (plus tax and gratuity). Thanksgiving Feast: Mouthwatering entrée selections like traditional slow-roasted turkey with sage stuffing, mashed potato and cranberries, pan-seared salmon and prime rib are on the menu at our traditional Thanksgiving feast, which takes place in The Leopard Lounge & Restaurant. Date: Thursday, Nov. 23. Three sittings: 1:00pm, 4:00pm, and 7:00pm. Price: $69.95 per adult, $16.95 per child 12 and under (plus tax and gratuity). Cookie and Cupcake Decorating Class: Your children will enjoy a wonderful afternoon of fun during this hands-on class in the courtyard, in which Pastry Chef Zieg demonstrates the art of holiday decorating. Best of all, your children will get to take home their special creations! Be sure to make a reservation, as this class fills up fast. Date: Sunday, Dec. 3. Time: 2:00pm – 4:00pm. Price: $10 per child; parents attend for free. Christmas Eve and Christmas Day Dinners: Bring your friends and family and enjoy a holiday feast with all the trimmings, prepared by Executive Chef Gerard Coughlin and his talented team. 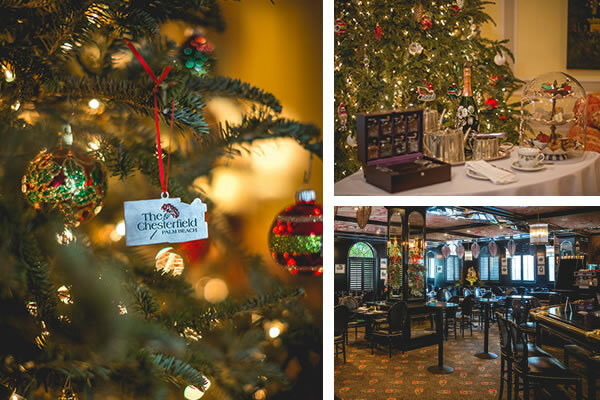 Featuring delicious entrée selections including prime rib roast, roast turkey, pan-seared wild Atlantic salmon maple-glazed Christmas carvery ham and prime rib of beef, this festive feast is served in The Leopard Lounge & Restaurant. Price: $110 per adult, $55 per child 12 and under (plus tax and gratuity). Christmas Eve Dinner: 5:30pm – 11:00pm. Christmas Day Dinner: Noon – 11:00pm. New Year’s Eve Gala: Ring in the new year at our glittering and glamorous gala dinner in The Leopard Lounge & Restaurant, featuring a mouthwatering four-course menu. Dance the night away to live entertainment, and welcome 2018 with party favors and a Champagne toast at midnight. Reservations required; jackets and ties for gentlemen. Price: $150 per person for 6:00pm seating (dinner only); $250 per person for 8:30pm seating (dinner plus New Year’s Eve Gala). “Home for the Holidays” Package: The stunning surroundings and lovely weather of Palm Beach combined with the stylish and elegant environment of the hotel makes the Chesterfield the perfect home base for Thanksgiving, Christmas, or New Year’s Eve – and this special two-night seasonal deal provides the icing on the holiday cake! The offer includes two nights in a beautiful room or suite, a complimentary glass of Champagne on arrival, English breakfast each morning, valet parking service, a mixology lesson with two cocktails per person, and we’ll even pack towels, chairs and sunscreen for you to take to the beach. Valid from October 1, 2017 through January 2, 2018. Prices start from $335 per night (excluding taxes) based on two adults sharing a classic queen superior room. For more information or reservations, contact The Chesterfield Palm Beach at 1-561-659-5800. Red Carnation Hotels is a collection of family-run, award-winning boutique hotels in the UK, Ireland, South Africa, Switzerland and the USA. Each hotel is a landmark of history and tradition; from the recently restored Ashford Castle in Ireland, to the Milestone, a historic mansion hotel in the heart of London, to the truly iconic Oyster Box in South Africa – these hotels are unique and characterful with a personal approach to hospitality. With a peerless reputation for exquisite fine dining, leading spas and sumptuous surroundings, Red Carnation prides themselves on delivering warm, thoughtful and highly personalized service. For more information about these award-winning hotels and the rest of The Red Carnation Hotel Collection, go to http://www.redcarnation.com.